What to Know About Mayor Stoney's Education Plan | News and Features | Style Weekly - Richmond, VA local news, arts, and events. Scott Elmquist City Council member Kristen Larson and Thad Williamson from the city present the mayor's education compact to a group of people at Westover Hills Elementary School on Apr. 5. Mayor Levar Stoney’s education compact, a key promise of his campaign, was released in February. Members of the School Board and City Council have embraced the idea of it, intended as a broad commitment to collaboration and not a strategic document. Two more public meetings about the education compact will be held next week, with a final version going before elected bodies as a resolution, Williamson said. What is the education compact? In addition to codifying collaboration, it sets broad achievement goals for Richmond’s 24,000 public school students. It affirms a commitment to the whole child — meaning that improving schools also means improving social services. “You don’t move a child out of poverty unless you move an adult out of poverty,” Williamson said. The compact creates a team — that will meet monthly — of two council members, two board members, city administrators and a host of other representatives. It intends hold quarterly meetings of the full bodies of council, School Board and the mayor. What do people have to say about the compact? In recent public meetings, people asked if it would have full-time staffing — and whether the people on the team had time for another bureaucratic meeting. Questions were raised about how resident members of the team would be chosen. What other concerns were expressed at meetings? A former high-school football coach bemoaned rules that kept nonteachers from coaching. A woman wanted to discuss individualized education plans for special needs students. Ideas were exchanged about getting people to come to PTA meetings. Funding was a huge topic. 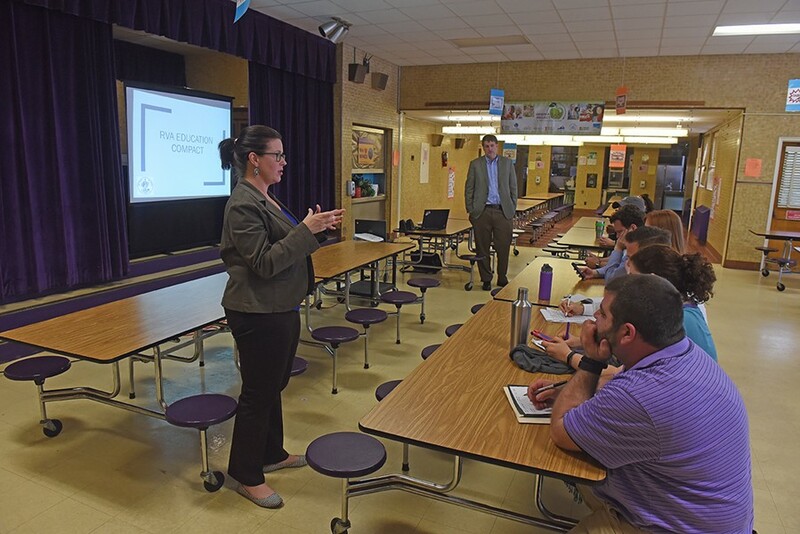 People wanted to know about the facilities maintenance plan and the chances of implementing a Roanoke-like model of a dedicated city funding stream for schools. Attendees lamented the local composite index, the state school funding formula that disadvantages cities like Richmond. Even School Board member Jonathan Young got off topic at Westover Hills, using the opportunity to push an idea about using facilities beyond the school day. Williamson wasn’t bothered by meandering discussions. If anything, he said, they show a need for more schools-centric community discussions.